Bangladesh weathered a batting collapse to pull off a shock World Cup win, inflicting a second defeat on England. England hit a modest 225 in Chittagong but looked on course to defend it after taking five wickets for 14 runs between the 30th and 40th over. But a heroic ninth-wicket stand between Shafiul Islam and Mahmudullah turned the tables on Andrew Strauss's men. The pair put on 58 from 56 balls for a remarkable two-wicket win that was sealed with six deliveries remaining. The result keeps Bangladesh alive in the tournament and means that - even if England beat West Indies in Chennai next Thursday - they will have to rely on other results going in their favour to progress into the quarter-finals. For that game, England will surely play more than the one spinner they did in this match against Bangladesh. If so, James Tredwell could make his World Cup debut under huge pressure. Bangladesh, their startling batting collapse notwithstanding, were good value for a victory that helps to ease their memories of being bowled out for only 58 by West Indies in their previous match in Mirpur. The job for England's bowlers was made tougher by the dew which descended as soon as the floodlights came on at the start of the Bangladesh chase. The first ball was replaced before the mandatory 34-over change and only when England were on to their third ball had they discovered a way to keep it dry enough to establish some control. However one constant disappointment was James Anderson, whose nine wicketless overs cost 54 runs and he was the worst culprit as collectively England conceded a shocking 23 runs in wides. At one point Graeme Swann, the only spinner selected by England, visibly lost his cool, pleading for some assistance from Darryl Harper when appeals and various pleas for replacement balls were rejected. Unlike in their defeat by Ireland, England did not lose the match because one player on the opposition took a difficult chase by the scruff of the neck. This time - save for the period in which they were rattling their way through the Bangladesh middle and lower order - they looked an unfocused rabble for the majority of the match. Things started badly with the bat after they had been inserted by the Bangladesh captain Shakib Al Hasan. Matt Prior's already chequered one-day international career hit a new low when, having been called on to open the batting, he was stumped in bizarre and avoidable circumstances by Mushfiqur Rahim. As Prior absent-mindedly dragged his foot out of his crease, the Bangladesh wicketkeeper gleefully whipped off the bails, only for Prior to leave his crease once again - whereupon Rahim removed the stump and held a ball to it to make absolutely certain. 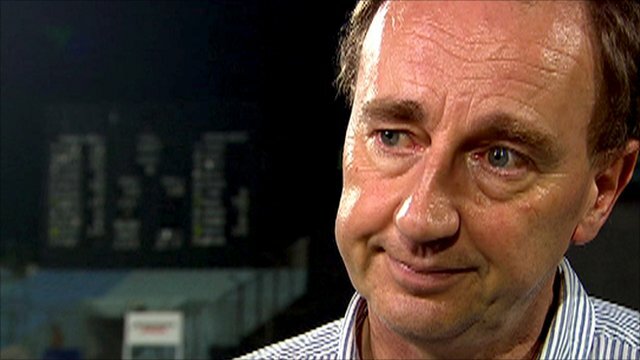 Prior's repeated failures make the selectors' removal of Steve Davies from the side after only one match of the series in Australia look ever more curious. Strauss joined Prior back in the pavilion when cutting the off-spinner Naeem Islam to slip, and Ian Bell showed his shortcomings in such conditions on slow, low wickets. Having been rendered virtually runless, he tamely chipped a catch to midwicket. With England a depressing 53-3 in the 17th over, it was left to Eoin Morgan (63 from 72 balls) to make his team competitive. 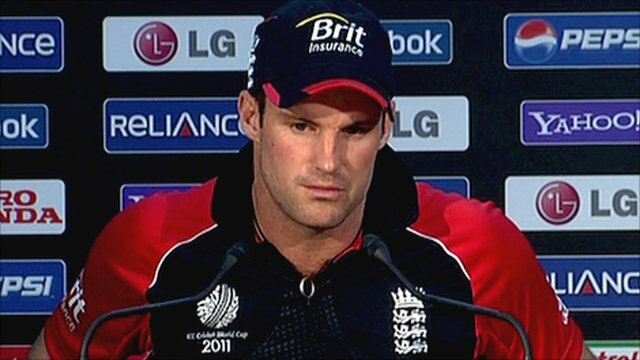 Morgan had barely had time to acclimatise to conditions, having been flown in from London to replace the injured Kevin Pietersen. But he had enjoyed himself in the 2010 series in Bangladesh, hitting a century in Mirpur, and again showed himself adept at getting to the pitch against the spinners and hitting drives into space for the boundaries, which were badly needed. With Jonathan Trott, who scored four more runs than his partner but faced an extra 27 balls, dinking the ball about for singles and adding the occasional reverse-sweep, the two batsmen took England to the 39th over without further loss. Crucially for Bangladesh, however, when they did strike again it was Morgan who was dismissed, thanks to a wonderful effort from Kayes, who charged in from deep square-leg and dived forward to claim the catch. That left Trott and Ravi Bopara to negotiate the five-over batting powerplay, and by the end of it both had departed to poorly executed attacking shots and England had only added 33 runs. Swann supplied two desperately needed boundaries, but England reached only a bare minimum score when Paul Collingwood, recalled to the side but batting way down at eight, and Anderson ran some quick ones and twos in the final couple of overs. Tamim Iqbal began the Bangladesh chase well with a controlled, though positive, 38 from 26 balls. England's bowlers briefly found their range after Iqbal had been bowled by Bresnan, with two more wickets falling cheaply. However an 82-run stand from 104 balls between Kayes and Shakib put Bangladesh in an excellent position. Then Kayes was needlessly run out as he was beaten by a fine throw from Ajmal Shahzad and Bangladesh skipper Shakib Al Hasan was bowled as a bottom-edge off an attempted sweep against Swann crashed into his stumps. Shahzad, by some distance England's most impressive bowler, moved two balls nicely off the seam to dismiss Mushfiqur and Naeem as England moved in for the kill. Some Bangladesh fans, so buoyant for much of the contest, were already heading for the exits when Swann then supplied the eighth wicket as Abdur Razzak swung across the line and was caught by a diving Tim Bresnan at long-on. But out of nowhere, Mahmudullah and Shafiul Islam took 16 runs from Swann's final over, and the ninth-wicket pair coolly took the requirement down to 33 from the last five overs. Anderson had been the weak link throughout and he was unable to control his inswinger, presenting the batsmen with three more wides, one costing an extra four runs as it eluded Prior's gloves en route to the boundary. Shafiul, the number 10, skewed a boundary off Bresnan from a thick outside edge in the next over and then drove the wilting Anderson past mid-off for four more. The winning runs came when Mahmudullah hit Bresnan through the covers and the home fans celebrated wildly. While England are no longer in complete control of their own destiny, the co-hosts know that wins against Netherlands and South Africa in their final group matches will seal a last-eight berth.